KATHMANDU, Nepal, March 22, 2019 (ENS) – The snow and ice that has shrouded Mount Everest for thousands of years is melting in the warming climate, exposing the bodies of climbers who have lost their lives on the world’s highest peak. Through the end of 2018, 288 people have died attempting Everest on all routes, according to Alan Arnette, whose blog reports on mountaineering activities throughout the world. The veteran of four Everest climbs, in 2014 at age 58 Arnette became the oldest American to summit K2, the world’s second highest peak. Sitting directly on the border between Tibet and Nepal, Mount Everest presents two commonly climbed routes up the 29,028 foot (8,848 meter) peak to the top of the mountain – the South Col Route from Nepal and the Northeast Ridge from Tibet. Climbing from the Nepal side is more popular but also has a higher death total and death rate, says Arnette. 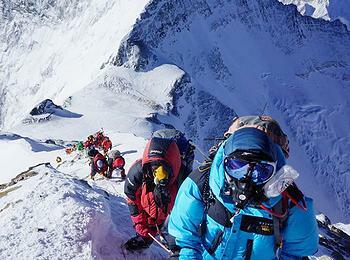 The Nepal side has had 5,280 summits and 181 deaths, while the Tibet side has 3,206 summits and 107 deaths. Arnette notes that the death rates are for all climbers, including those at base camp, and not just those who summited. 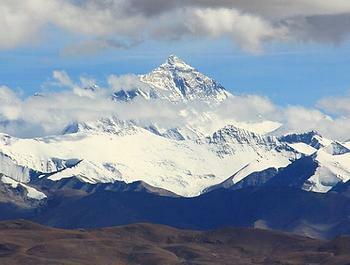 The BBC reports that bodies now are being removed from the Tibetan side of Mt. Everest as the spring climbing season is just about to start. The Expedition Operators Association of Nepal, EOAN, told the BBC that dealing with removing the dead bodies has been difficult because of a law requiring the involvement of government agencies. “This issue needs to be prioritized by both the government and the mountaineering industry,” EOAN President Dambar Parajuli told the BBC. In 2016, the BBC reported that returning a body to a family costs thousands of dollars, and requires the efforts of six to eight Sherpas, potentially putting those men’s lives in danger. Dave Hahn, a mountain guide at RMI Expeditions who has summited Everest 15 times, told BBC that, “the time to move a body is when the accident happens,” before it freezes onto the mountain. Climbers say human remains are usually committed to the mountain, pushed out of sight or covered with rocks as a burial mound. But now, climate change is melting ice on Everest that has not been melted for eons, exposing bodies wherever they lie. Removing the bodies is a most expensive process. In 2016, The Washington Post reported that it can cost between US30,000 and $70,000 to bring a body down from the mountain. Since 2008, Dawa Steven Sherpa, managing director of Asian Trekking and Tshering’s son, and his colleagues have led annual cleanup efforts on the mountain. They have removed more than 15,000kg of trash and more than 800kg of human waste. Through 2016, with respect for the dead, they disposed of several bodies – four Sherpas, one of whom they knew, and an Australian climber who disappeared in 1975. More warming and melting of snow and ice on the highest peaks is inevitable, according to a new report from the International Centre for Integrated Mountain Development, ICIMOD. If global warming continues, the report warns, two-thirds of Himalayan glaciers could melt by 2100. Temperature across the mountains of the Hindu Kush Himalayas is projected to increase by about 1 to 2°C by 2050, and even more at higher elevations, according to a 2015 study cited in the ICIMOD report. Winters are expected to grow warmer at a faster rate than summers in most places, and melting glacier ice is likely to trigger major floods and crop destruction – and expose more climbers’ bodies.